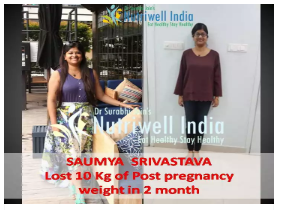 My name is Saumya and I turned 33 this October .i am an engineer by profession and a mother to a 2.5 year old boy.throughout my twenties I was a regular gym visiter whether it was pre or post marriage and was never considered fat by any means .i had a very normal pregnancy but post delivery by sec –c I gained a lot of weight approximately 12 kgs to what I was before the baby .being a full time mother for another six months did not give me chance of diet,exercise or hit any gym or you can say I was too occupied with the new responsibility and was lazy to do anything about it for another 2 years . I was commented upon by many of my friends and relatives that you used to be so fit and and are you expecting again ( seeing my huge belly )and that was realy saddening but I kept going not doing anything about it. Iheard from some of my friend who lost the post pregnancy weight by following a healthy diet through a professional dietcian and then it struck me that I might also need a guide support and a strict person to help me regain my body and confidence .and then I got to hear about nutriwell .to be frank I choose it because the reviews were good ,it was near to my office I had to start with some place at the first place. So my journey started on 7 september 2016 when I first meet dr surabhi 69kg .my BMR was low,I had fat spread out on all major body parts and I was getting short of self confidence in my personal and professional life .meeting surabhi for the first time gave me a ray of hope and induced a lot of motivation shed these extra kilos .the diet she prescribed was very difficult to start with as I had all bad eating habits (oily,deep fried,junk,street food)but within 2 days I was feeling so good and fresh diet contained all the nutrients and I felt like I am eating all day non-stop .i lost 2 kg in first four days..yahoo…and so my journey began with dr surabhi and her warm staff.i liked idea that neetu would call you first thing in the morning to confirm if you are coming for the appointment or not and also help in rescheduling if you need a change .i never had to wait much for my appointment and dr surabhi was usually very quick and competent in knowing if I had exercised less or did not follow the diet for which I was scolded once or twice but in turn that infused more motivation in me to give better result next week. The key to lose weight is true dedication sacrifice of the bad habits and accepting good health habits.also,just reducing weight through a diet plan would not help in the long run and it has to be accompanied by an exercise regime to keep us strong ,fit and toned. I would like to mention that the diet and the herbs provided by nutriwell was safe and I never had to strave myself as compared to the notion people tend to have when they hear someone dieting to reduce weight .thankS to nutriwell for giving my body and self –confidence back to me .it feels so good when people in family and office give compliments and your husband has an admiration in his looks and gestures. Thanks a lot…. Keep up the great work.